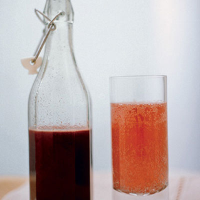 I love the deep colour of this drink – it looks fresh and vital. Other berries work equally well and, if I'm in Devon, I'll pluck some elderflower heads from the hedgerows on our farm to add a delicate Muscat flavour. Crush the blueberries and the sugar with a potato masher in a bowl. Add the lemon slices, elderflowers (if using) and tartaric acid. Pour over 500ml boiling water and stir until the sugar has dissolved. Allow to cool, cover with a tea towel and store in the fridge for 4 days. Taste and see if it is strong enough; if it's not, give it another day in the fridge. Strain through a muslin-lined sieve and decant into sterilised bottles. The cordial will keep in the fridge in unopened bottles for up to 6 months. Serve with sparkling water.